Everyone acknowledges that pricing is a key contributor for business results. A too high price level sacrifices the top-line and a too low one has an immediate effect on the bottom-line. However, pricing is much more than setting up a right price level. This article gives an overview on how pricing analytics should be done, what are the key decision points in a pricing model and what must be taken into account to ensure a successful implementation of a pricing model. Pricing theories present three different methods for pricing analytics and for setting up the right price level: cost-based pricing, market-based pricing and value-based pricing. Too often only one of these methods is used and the others are considered as “old-fashioned”, “too theoretical” or “impossible” alternatives. Using all of these methods in parallel is not always possible, but it should be the objective of every pricing exercise. Cost-based pricing is by far the most commonly used method. Analyzing cost drivers and adding a margin requirement on top of that is a simple and rather easy way to do pricing. Some consider it as an old-fashioned method, but it should still always be used, at least a reality check to ensure that the profitability implications of a pricing model are well understood. 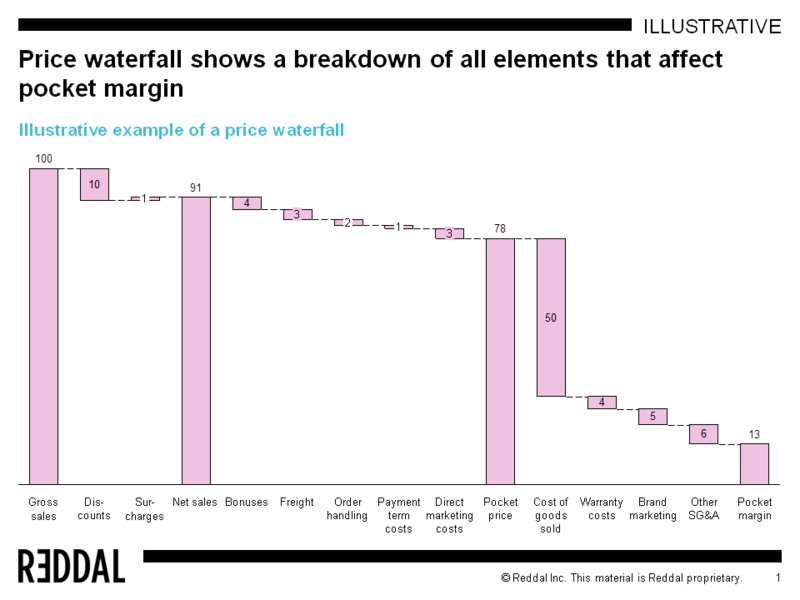 Every pricing exercise should include a price waterfall, which splits the total price to discount, cost, and margin components (picture 1). This basic analysis helps to understand what the impact of different pricing elements is currently. In a market-based pricing, the price is set by comparing product/service features and prices to competitors. There are two common mistakes in the using of market-based pricing: using it as the only pricing method or not using it at all. Market-based pricing is suitable for situations where prices are transparent and there are small differences between the products/services. Even in those cases it should not be the only approach – meeting competitor pricing does not make sense if it leads to negative operating profit or if our solution creates much more value to our customer. Market-based pricing cannot be used if there are big differences between own and competitor solutions. Even in those cases price comparison is useful to get a reality check: are customers willing to pay this much more for the additional features that we offer. Value-based pricing is too often only a buzz word that everyone is talking about but only few are applying in practice. In value-based pricing customer benefits are quantified and the price is set to a level that makes solution attractive to customer. Value-based pricing is especially suitable for investment goods and outsourcing services that can have a clear business case. Combining value-based pricing with cost-based pricing can show that it is not possible to create value to both parties at the same time. In those cases a design-to-cost project is needed to reduce costs to a level that enables value creation. To learn more about design-to-cost, see the Design-to-Cost toolkit in Reddal Share. Combining cost-based pricing, market-based pricing and value-based pricing analytics methods gives an overview about suitable price level. However, these pricing analytics methods give an over simplistic view on pricing. The most important and the most difficult pricing decisions take place when the actual pricing model is designed. Preferably, a pricing model should be done on a customer level but in many cases product-level pricing is the only viable alternative. No matter what is the dimension to be analyzed, categorizing customers and products based on their characteristics is a starting point to guide key decisions. A good pricing model differentiates pricing based on product/customer characteristics, simplifies pricing structure, matches the wanted risk level and steers all stakeholders to the right direction. Pricing is typically differentiated by using volumes and competitive position as drivers for decision-making. Same pricing is not suitable for low- and high-volume customers/products. Also, the competitive position sets boundary conditions – smaller margins should be accepted in categories/segments where competition is more intense and price sensitivity is higher. Especially in B2B-type of businesses large accounts have better bargaining power and end up having lower prices than the small accounts. Pricing model should end up to a rather simple fee structure to ensure that it is easy to communicate. In cost-based pricing the breakdown of costs should be done into detailed level and the target of a pricing model is to decide which elements are priced separately and which are bundled. For example, telecom operators have been simplifying their fee structures a lot during the last ten years. In old days operators priced peak-time and off-peak calls with different fees as number of calls in peak time is one of the main drivers for network costs. Nowadays operators sell large bundles that include calls, SMSs, data connection and multiple value-added services under the same monthly subscription fee. Selecting a fee structure is a key in balancing risks and returns. In a fee structure the key questions are whether the fees should be variable or fixed and whether the fees are transaction-based or recurring. Fixed recurring fees provide a steady and predictable cash flow and the main risks occur if costs are variable. On the other hand, transaction-based variable fees can be adjusted based on cost level, but the revenues are highly volatile. Risks occur always when converting variable costs to fixed fees or vice versa. Different fee structures can also be combined: for example, industrial equipment manufacturers sell typically products with a fixed, transaction-based fees and service contracts with recurring fees that are depending on the service level. Pricing exercise should also cover bonuses, discounts and surcharges that are used for different purposes. Bonus and discount structure can also be differentiated for different customer/product categories. Bonuses and discounts should be designed in a manner that it encourages customers to buy more and reward the best customers instead of giving the same flat discount to every customer. A well-designed surcharge model can also improve profitability and steer customer behavior to the direction that makes supply chain management easier. A good surcharge model ensures that customers are incentivized to make large enough but still regular orders. Most of the work in a pricing project or process is related to the actual implementation. 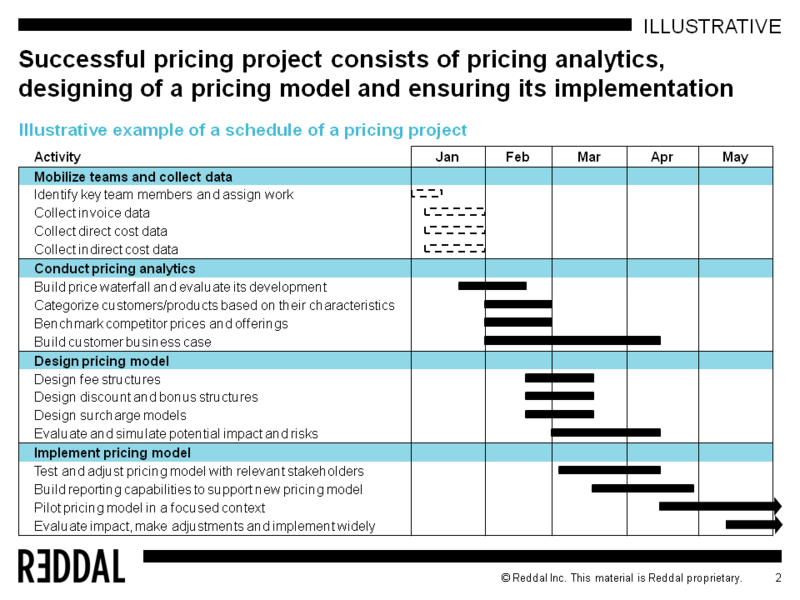 Market and cost analysis and designing of a first-cut pricing model is still a small part of the actual work needed to make pricing exercise successful. New pricing models should be tested with different stakeholders and piloted in a selected context. Also, a lot of effort is needed to enable further iterations by developing reporting and decision making mechanisms. Testing new pricing model with customers and sales force already before the implementation helps in identifying possible surprising effects of a new model. Still, the results of changes can be seen only after the model has been implemented. It makes sense to pilot the new pricing model in a smaller environment first before taking it into use more widely. Pilots can be done by using limited customer segment or geographical region as a test field. New pricing model can lead to surprising outcomes, especially if the changes are significant, and piloting can limit the effect of unwanted outcomes. Building reporting to support pricing analytics enables fact-based decision making already in pilot phase. Availability of customer/product profitability information is the most common bottleneck in doing pricing successfully. Therefore, improvement of these capabilities should also be considered as part of all pricing exercises. To learn more about the importance of financial management capabilities in SMEs, please see our previous newsletter. Overall, a successful pricing exercise is a combination of hard analytics, innovative design of a pricing model, and building capabilities for further iterations (picture 2). Analytics phase gives required data points and increases confidence for decisions. On the other hand, designing of a pricing model cannot be based fully on facts especially in cases when bigger changes are done for the pricing logic. This sets requirements for enabling iterations and piloting decisions first before implementing the new model widely.